Most people don’t associate cities with trees, but urban areas are actually dependent on healthy forests. Trees within cities reduce heat, provide spaces for recreation and socialization, and increase property values. Nearby trees in the watersheds around cities filter drinking water and help prevent flooding and landslides. Even forests hundreds or thousands of miles away from a city still play a role in its health; these lands are essential for generating rain for the world’s farm belts, curbing climate change, and providing wood and other commodities. Cities are waking up to the fact that their survival depends on forests. Today, 45 cities launched Cities4Forests, committing to protect, manage and restore forests at three scales: inner forests, nearby forests and faraway forests. 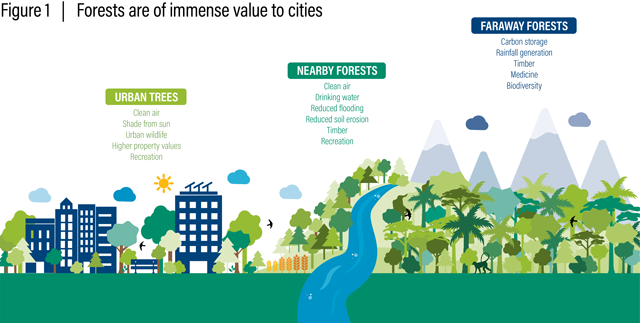 With these founding cities, more than 150 million urban residents will benefit directly from improved forest management. Trees within cities—from those that grow in parks to ones that line sidewalks—help with everything from mitigating heat to boosting residents’ health. 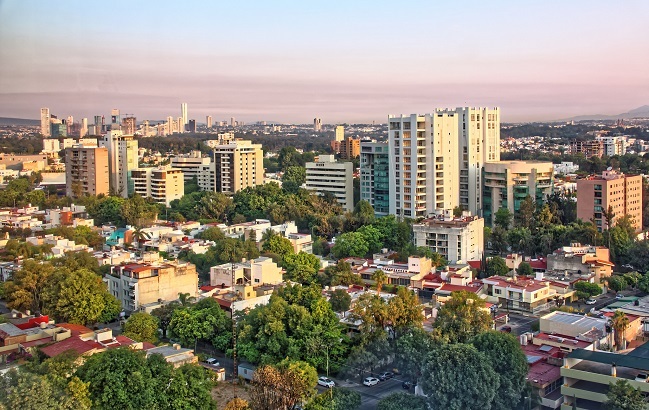 Mexico City, home to more than 8.8 million people, is incorporating forests into its urban strategy to address major challenges. 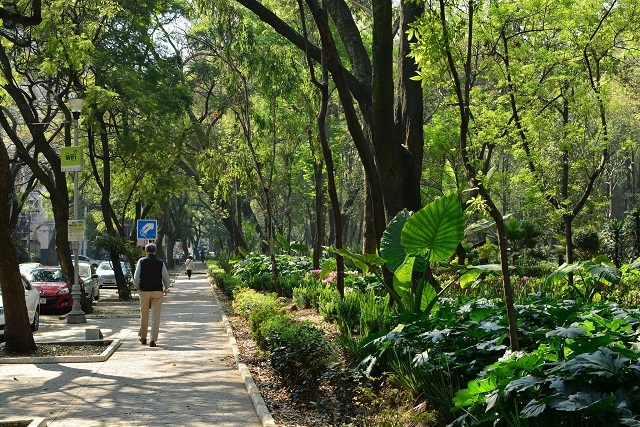 Nearly 60 percent of Mexico City’s territory is protected conservation land. These green spaces help absorb rain to replenish the city’s overexploited aquifer, reduce carbon dioxide emissions, and provide habitat to more than 4,500 species of plants and animals. Most recently, the city created the Forest Carbon Bond, protecting more than 2,000 hectares (4,900 acres) of forest in the San Nicolás Totolapan forest for the next 30 years. These forests are expected to capture more than 33,000 tons of carbon just in the next five years—the emissions equivalent of the annual energy use of 18,000 homes . Additionally, Mexico City is working on increasing the quantity, quality and distribution of green areas. During the last six years, the city has developed new public parks like La Mexicana, La Viga, Planta de Asfalto, Ecoducto and Los Coyotes. The Public Pocket Parks Program turned 28 underutilized street spaces and abandoned areas into public spaces, including nearly 22,000 square meters of green space. Most of these spaces are in low-income neighborhoods, allowing for fairer distribution of urban trees and their benefits. The state of a city’s surrounding area directly impacts air and water quality, as well as overall quality of life. Healthy forested watersheds upstream of a city filter water, control flooding and provide recreation. More than half of Americans rely on forested lands to capture and filter their drinking water. Raleigh, North Carolina owes much of its water supply to the Upper Neuse River Basin. The 770-square-mile basin drains into Raleigh’s Falls Lake Reservoir, the city’s primary water source. The forests that make up 60 percent of the basin’s area filter water that eventually makes its way to the taps of 500,000 residents of the Raleigh metro area. Through the Upper Neuse Clean Water Initiative, the City of Raleigh and six local land trusts joined forces to address threats like water pollution and development. By implementing a surcharge, or water protection fee, of 15 cents per 1,000 gallons of water, the Upper Neuse Clean Water Initiative has been able to safeguard the river basin. The fee received little pushback from customers, as it averages only 60 cents per month per household. The city has used these funds to protect more than 84 miles of stream banks and work with landowners to avoid nutrient pollution. For a small price, citizens of Raleigh and its surrounding area will continue to benefit from the Upper Neuse River Basin’s clean water, beauty and opportunities for fishing and hiking. While the benefits of urban trees and forested watersheds nearby have long been understood, the contributions of faraway forests to the well-being of city-dwellers are only starting to be appreciated. Tropical deforestation is a major contributor to global greenhouse gas emissions, and forests have been incorporated into global climate change negotiations. We now understand that forest protection is an essential element of any strategy to stabilize the global climate, and thereby mitigate the risks posed to cities by sea-level rise and increasingly frequent and severe extreme weather events. In the meantime, new science is revealing that faraway forests can affect cities in other ways as well, such as generating rainfall essential to maintaining agricultural productivity on farms that produce food for urban residents. And earlier this year, scientists warned that a combination of deforestation, climate change and widespread use of fire in the Amazon region might be linked to the severe droughts and flooding that have affected cities in Brazil and adjacent countries in recent years. 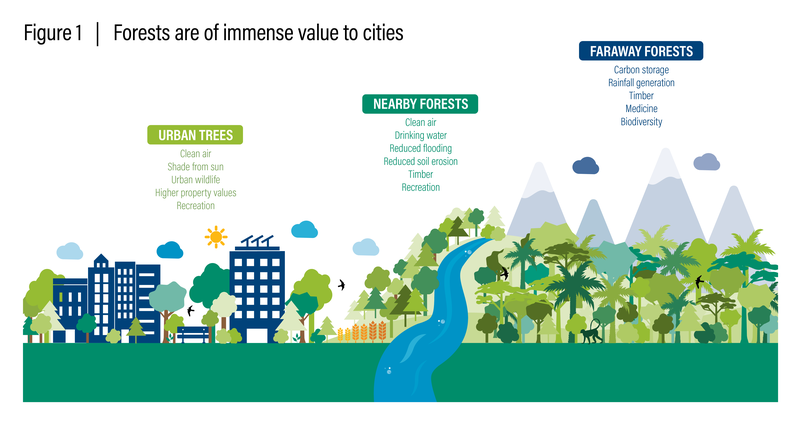 What could cities do to help conserve faraway forests? For one thing, they can ensure that their own consumption patterns are not contributing to the problem. The International Resource Panel estimates that material consumption (including wood, sand, gravel, iron ore and coal) by the world’s cities will grow from 40 billion tonnes in 2010 to about 90 billion tonnes by 2050. Cities have the power to choose whether these materials are sustainably sourced. When the City of London hosted the Olympics in 2012, officials took a stand for forests by making sure all the timber used to build the Olympic Park and Athlete’s Village was certified as legally and sustainably produced from well-managed lands. Many of the 45 cities that have joined Cities4Forests already understand how important forests are to their residents. Now they’ll show how cities, in turn, can help forests by restoring and protecting these critical landscapes. Cities4Forests is designed to boost existing efforts around forests by injecting additional energy, enabling access to resources, and helping cities take bold new steps. The initiative will provide the forum, relationships and technical support needed to better link cities and forests. Cities will learn from their peers and institutions with expertise in forests, climate change, water, communications, finance and policy. Cities will receive guidance on issues from urban forestry strategies to developing procurement plans and building codes that minimize impact on forests. 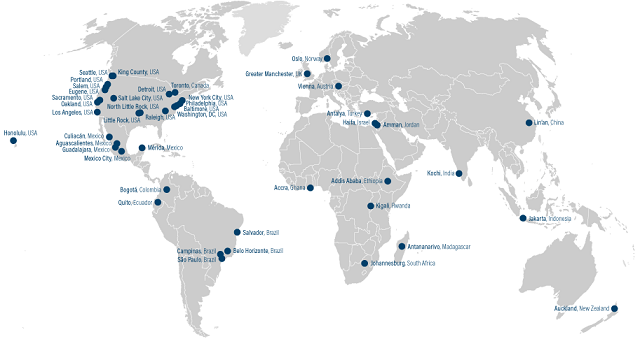 The founding cities and early participants in Cities4Forests will be critical partners in shaping the network’s priority areas and membership. Over time, the platform aims to grow – not only by expanding the number of participating cities, but also by aligning with complementary platforms and partner organizations. Encourage your city to join the initiative, and learn more here. John-Rob Pool is a Research Analyst for WRI’s Natural Infrastructure for Water Program. Frances Seymour is a Distinguished Senior Fellow at WRI. Todd Gartner is the Director of WRI’s Natural Infrastructure for Water Program. Mariana Campos is the Urban Development Manager at WRI México.